This entry was posted in 1, Blogging, Skip Allen & Painter 11 and tagged Alpha Channels, Digital Art Academy, Eastern Water, layers, Mixer Pad, Painter Talk, Skip Allen, Sumi-e Painting, Watercolor. Bookmark the permalink. Ohhhhhhhhhhhh I used to do a lot of silk painting. I loved it because it was so fluid and alive! A bit unpredictable and when you oops on that you can’t repaint your canvas! It forces you to be really creative in dealing with those artistic mishaps. I bet the pieces were beautiful. Back when I was a potter, I had a friend who painted on silk…the look is stunning. Do you still do some silk painting? I’ve only just found your site. I hope you’re going to blog some more. This is beautiful work. I love the silk look. Will you be doing some of this in the Painter Talk workshop? Thanks for visiting and I hope you come back. I do plan to blog more. It is a lot of fun. Yes, I do plan to do more of this style work in the Painter Talk workshop…see you there. 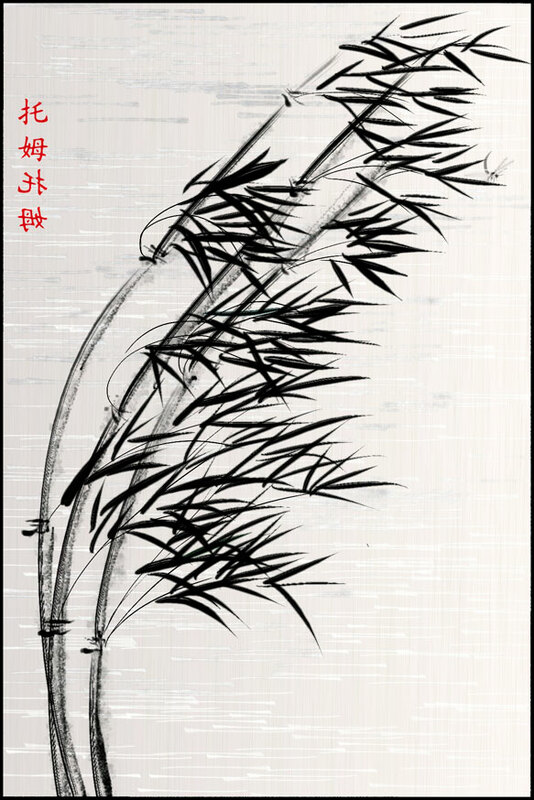 I love your bamboo on silk painting ‘Wind’! Are you selling your paintings? Is this one available? Thank you so much Amber! I just paint for the fun of it and haven’t tried to sell my work. Before I retired, I made my livelihood as a potter, and yes, I sold tons of pots. 🙂 Maybe in the future I will sell my work, but I don’t know. Thanks for dropping by and taking a look. And a special thank you for making a comment. It means a lot to me. Thank you so much for the ping back. I love the haiku in honor of Jane Reichold. But then I took some time and looked through your blog. I really enjoyed it. I am now following you. I have seen many good sumi-e bamboo paintings done with actual brushes and ink, so I feel competent to praise your digital version. Glad U liked my post that borrowed it. Thanks for the follow. Thank you again! I love trying to emulate traditional sumi-e. It is lots of fun. That particular image has been popular. It even got purloined and now adorns the cover of a book on Buddhism…without my permission or any acknowledgement. I found that sort of funny. I saw it used with a poem somewhere on somebody’s blog, but I forget where. It is fine, I don’t mind, but it is such a pleasure when someone actually gives you credit. I really do thank you for that. I look forward to seeing more of your haiku. Glad that the authors of the book and the poem also liked your work; sad that no credit was given. I do see many uses of images that look like the user got them from someplace else and neglected to give credit. I admire your mellowness about being cheated that way. I might as well be mellow. This sort of thing happens all the time and you normally have no recourse to do anything. With the author and her blog, she wasn’t trying to make money or anything like that. She just thought the image fit her poem or the image influenced her poem…not sure exactly…anyway…I took it as a compliment. If I could get to the publisher of the book, I would ask them to stop using it, but they are an Asian company and I never could find a contact. I’m sure the author provided it and the company probably didn’t check it. I may be naive, but I think most of the time folks don’t think they are stealing. Now…I did feel differently when my one of my images showed up on iPhone covers being sold on Amazon and a couple of other large online firms. That is going a little too far. But, I must admit…I really did want to buy one. Anyway, I just sent a note to the retailer and the items were immediately removed. But, looking at all of the covers it was obvious that most had been stolen from digital artists. I decided to look for the image again and see what I could find. I do this by going to Google Images and dropping the image into the search box. There are quite a few incidences on Pinterest, which normally give credit…most of them are for tattoo artist…I would love to see one of my images on a person. Then there is Bamboo Living Homes. That is a new one I haven’t seen before. Another new one is Jenelle Kim. Hers is a blog post about inspirations, I think. I find it funny that the spiritually conscious seem to think any image is theirs for the taking. The Magic of Quiet. That one is from Spiritually Conscious. Aloka Lakmali seems like a nice person, but I don’t know what is written next to my image. You have to look down the page to see my image on Renu nilusha nilusha page. And…I don’t know what BasiReiki is saying either. It is nice to see my work displayed next to some fine examples of traditional sumi-e. Oh…here is the book…it is being sold by Carte Spriituala – Zen, I have to laugh at this stuff. I need to do a post about this stuff some time. This is only one image. But, then some folks do it right. Check out this post…Time of your Life…notice the credit at the end of the post. That’s nice and I appreciate it. OK…that’s enough of this stuff. But thanks for the conversation. It was fun to look for the images again. Maybe those who use w/o crediting just do not know any better. It might be helpful if U worked this comment into a post and then used the comments sections on some offending blogs to briefly note that there is a lapse and display a link to your post. Because U are so calm and good-humored about the offense, the offenders just might learn something rather than merely get defensive. I really should take your advice. I think I could explain the problem, but I’m not sure I have the energy or desire to take on this task. But I do believe it is mostly done by folks who really don’t know any better and are not meaning to use the images for personal gain. But, the practice is very wide spread. Yes, it is wide spread. And probably innocent, at least among those who are not selling stuff.